We’re big fans of Emily Duncan’s debut YA Slavic folklore-inspired fantasy, WICKED SAINTS here. Laura G has a blurb for it featured in the current kids’ issue of INDIE NEXT. And I found it such a fun page-turner that I begged Emily’s publicists for an interview and was delighted when they said yes! WICKED SAINTS is the story of warring kingdoms, blood magic, unlikely heroes, and a girl who hears the voices of any number of gods, all of whom provide her with guidance and magic. And oh yes, a healthy dose of forbidden love, because really what is a YA fantasy novel without a bit of that? Plus the dialogue is snappy and often disarmingly funny, always my favorite counterpoint to brooding and blood. JOY: I’m curious about your process for world building for WICKED SAINTS. Did the world come to you fully realized with all its blood magic and saint magic? Was it mostly Slavic folklore (which I personally adore!) that fueled your inspirations for fleshing it all out? EMILY DUNCAN: It was a slow build! I knew I wanted something Russian in origin, I knew that Russia’s mysticism and folklore would fit perfectly with the story I wanted to tell, but for a few years I could always tell something was missing when I tried to write the book, it just never worked. I had the divine magic angle, but everything fell apart when I tried to put together just why this enemy country was so terrible. It wasn’t until I added the Polish angle to the worldbuilding -- using two very different Slavic countries to play off each other -- and using blood magic to be a foil to the divine magic that everything started to fall into place for me. It took a few years of research and a few years of constantly trying to figure out the book and failing. JP: Nadya and Malachiasz definitely have an intense forbidden love that in some ways kept reminding of the Buffy/Angel relationship from Buffy the Vampire Slayer TV series. Malachiasz is everything that Nadya should--and does--abhor and want to destroy, and yet she finds herself drawn to him nonetheless. Can you talk a little about the dynamic between these two characters? ED: My favorite dynamic, and they’re especially fun to write because they’re both so very deeply set in their own specific and opposite beliefs: Nadya talks to the gods and is incredibly devout, Malachiasz is a heretic who’s as close to an atheist as you can get in a world where the gods have a rather active presence. But by being so set in their ways it means they just… argue all the time. They’re always bickering. They genuinely like each other and they also both love to needle and argue with the other. And it’s fun to take that lighter aspect of their relationship -- the bickering about theology -- and turn it to the more darker elements of the book like Malachiasz’s complete lack of moral fiber and Nadya’s wavering doubts (something Malachiasz absolutely takes advantage of, the jerk). They have a really fun chemistry in that star-crossed kind of way. JP: I was definitely drawn to Serefin, certainly an unlikely hero in the making, and I’m always a fan of unlikely heroes! Was he as fun to write as he is to read? And to add to that, do you have a soft spot for any one of your characters more than another? ED: Serefin and I are the most alike, which I’m never sure is something I should be admitting to, and he is both an utter delight to work with and one of the most frustrating characters I’ve ever written. It takes a lot of work on my part to get him moving, as he only ever wants to complain about his fate and drink a lot. And I love my whole cast but it’s no secret that Malachiasz is my favorite. Villains are always my favorite characters to write but he’s especially dear to me because he’s just a mess. He’s anxious and dramatic and calculating and just endearingly earnest for a boy who is absolutely terrible. JP: On a more serious note, I have noticed that you are very specific on line with trigger warnings about the cutting aspect of the blood magic. Were you conscious of this as you wrote? Were there any moments that you found yourself self-censoring? JP: I’m always fascinated by the writer’s journey of debut authors. 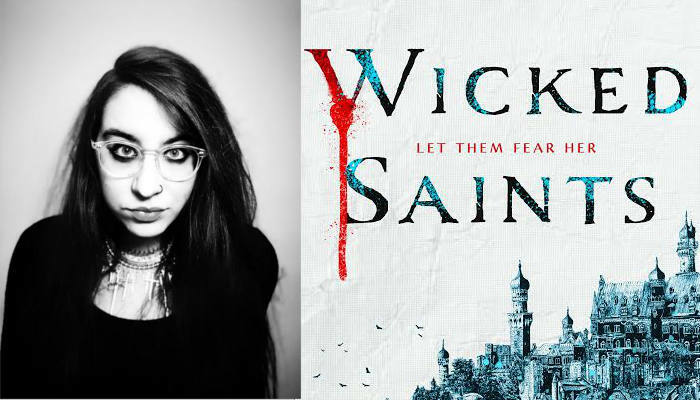 How did you get from youth services librarian to debut author of WICKED SAINTS? ED: I’m still a youth services librarian! I work full time. It always just seemed like the best place for me to be and what I’m well suited to. I like interacting with children and teens but teaching never felt right to me and librarian work is a nice melding of both things. I also wanted a job that I could do without it being mentally taxing, so that I could come home and write after working all day, and the library is good for that. It’s still a hard balance, most days, but I make it work. JP: What’s next for these fabulous characters and for Emily Duncan? ED: Book two! I am very excited for book two. It was incredibly difficult to write and I’m very proud to have survived it. Wicked Saints was a lot of deconstructed popular YA tropes and book two is what happens when I throw all of that out the window because I want things to be weird. I call it my cosmic horror road trip book. It’s cerebral and somehow even more bloody than the first book and I pushed the characters to their very limits. They’re all so tired, but, alas, no naps!